The Jersey Shore Boca men’s summer soccer program continued last week in the Mid-Atlantic Summer Showcase League (MSSL) as the Boca U20s split a pair of games in Vineland while the Boca U23s traveled to Staten Island and dropped two tough matches. The Winslow SC and FC Hudson United will visit the Manchester Soccer Complex on Fathers Day as both Boca teams make their home 2005 MSSL debut. 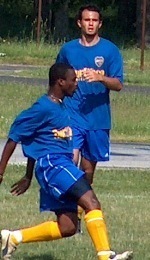 TOMS RIVER, NJ (June 15, 2005) – The Jersey Shore Boca men’s summer soccer program continued last week in the Mid-Atlantic Summer Showcase League (MSSL) as the Boca U20s split a pair of games in Vineland while the Boca U23s traveled to Staten Island and dropped two tough matches. The Boca U20s started the day with a 3-1 loss to Spirit United from Eastern Pennsylvania at the Vineland Soccer Complex in South Jersey. After United scored an own-goal on themselves early on in the game, they evened the match 1-1 just before the half ended with a low shot that got by Boca U20 goalkeeper Jon Curry-Edwards (Spring Lake Hgts). Curry-Edwards, who will be a sophomore at Old Dominion University in September, kept Boca in the match throughout the second half until United converted on a penalty-kick mid-way through. While Boca was pushing forward late in the game trying to even the score, United tallied the final goal with only a few minutes remaining to end match at 3-1. In the second game of the day, the Boca U20s began to pressure West Chester United (PA) from the opening whistle. Andrew Perez (LaSalle University-Brick) tallied Boca’s first goal at about fifteen minutes in when the controlled a service on the right side about eighteen yards out from American University bound Mark Petruniak (Hightstown) and buried the eventual game winner to the near post. Thirteen minutes later, two Big-East Conference players connected when Boca U20 goalkeeper Chris Konopka (Providence College-Toms River), who played the full second match in goal, snagged a high cross off his line and began the counter-attack quickly with a sixty-yard overhand distribution to Justin McGrath (Seton Hall University-Brick) on the left side. McGrath ran on to the ball, sprinted by a West Chester defender and placed a upper-ninety shot into the far post. The first half ended 2-0 in favor of Boca. The Boca U20s scored three more goals in the second half, including Perez’s second of the day, to make the final 5-0. They improve to 2 wins, 2 losses and 0 ties on the MSSL season and also record their first shut-out of the summer. Meanwhile, the Boca U23 team dropped a 4-0 decision to a powerful Silver Lake (NY) side in Staten Island in their first match of the day last Sunday. In their second game, the Boca U23s battled evenly with Arsenal World Class (NJ) for most of the afternoon match. After Arsenal tallied the first goal Boca’s Justin Fuccello (Brick) tied the game mid-way through the first half to bring the score even. Although Boca had some good scoring opportunities in the second half, they could not capitalize on their chances and the match ended 3-1 in Arsenal’s favor. John Plaugic (Kearny) who will be transferring from Monmouth University to Caldwell College in September was in goal both games for the Boca U23s. Boca (0-4-0) also played without forwards Ryan Campbell (Pt. Pleasant – Monmouth University) and Justin Campbell (Pt. Pleasant – Ocean County College) who were unavailable due to personal commitments. Both are expected to be on the roster for the next game. The Boca U23s will be looking for their first win of the MSSL season on Fathers Day when they play host along with their U20 younger counterparts to the Winslow Soccer Club (NJ) and FC Hudson United (NJ) for two games each on Sunday at the Manchester Soccer Complex starting at 10:30 am.